Linux, compared to the well-known monopolistic lock-in product, is frequently accused of having a steep learning curve. On the other hand, experts say of Windoze, and increasingly of some Linux distributions, that you "can't really do anything with it". How does that fit together? Pure intolerance on the part of the experts towards dummy-usable computers? In my opinion, not quite. 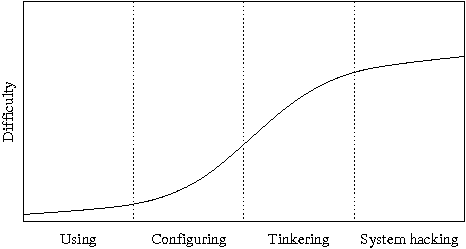 Learning curves, being curves, do not necessarily have the same steepness at every point. And considering the difference between ordinary humans and geeks, they are likely to be interested in different sections of them. 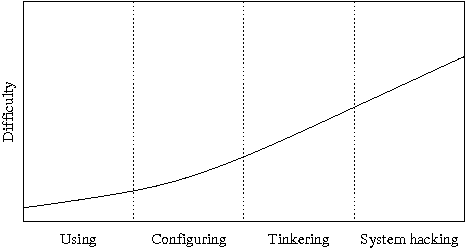 So what do operating system learning curves really look like? Here is a shot at an answer. Unsurprisingly, marketing and public relation being what they are, the biggest virus in the world does not present itself in such a favourable light once one looks at the whole picture. While basic use is easy, things become increasingly difficult once the computer's owner actually wants to tell his/her box how to behave. Things become absolutely impossible once you want something the vendor did not think of: A commercial company has no interest in supporting anything most people do not need, and protection of trade secrets guarantees a black box system. Things change considerably when you advance to one of the big commercial Linux distributions such as SuSE and Redhat. They are already halfway to what some people call a real operating system . The learning curve starts flat, if slightly higher than that of proprietary crapware. At the point where the difficulty of tuning a commercial system diverges, however, it merely rises steeply. This is the point where the dedicated hacker is forced to reverse engineer and render harmless distribution startup scripts and administration tools. Just as vendors of proprietary products, commercial distributions have little to gain from supporting minority interests, but at least this is legal and feasible within limited time. After distribution automatisms have been defeated, going the whole way and hacking the kernel is not much more difficult, as distribution-independent information is available. Finally a Linux distribution aimed at incorrigible tinkerers, such as Gentoo or Arch, may require some learning up front, especially if it has been configured for ease of use by a hacker. 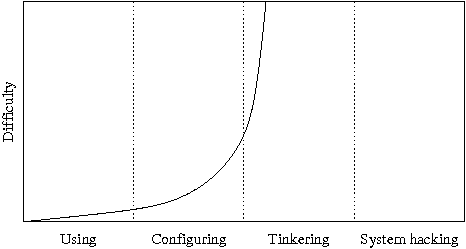 But the learning curve is the smoothest of all because information about tinkering at every level is readily available. It shows no steep sections or steps, being unaffected by misconceived notions about where a "normal" user should stop looking behind the scenes. Post Scriptum: I just discovered this article which has a similar learning curve comparison for text editors.